Hardcover books today are as much about sentimentality as they are about text, but the work of a young artist now on view at the Studio Museum in Harlem eschews textuality altogether for an aesthetic and material communion with these spined signifiers. 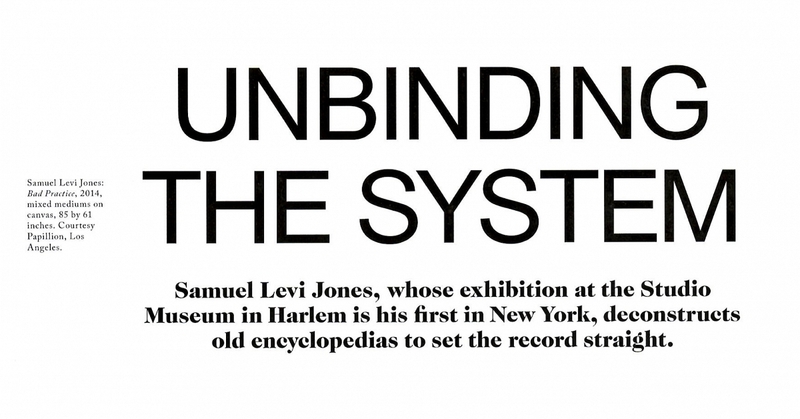 Californian Samuel Levi Jones has taken over the three walls of the project space on the lower level of the Studio Museum in Harlem for “Unbound,” a small but compelling exhibition curated by Naima J. Keith. 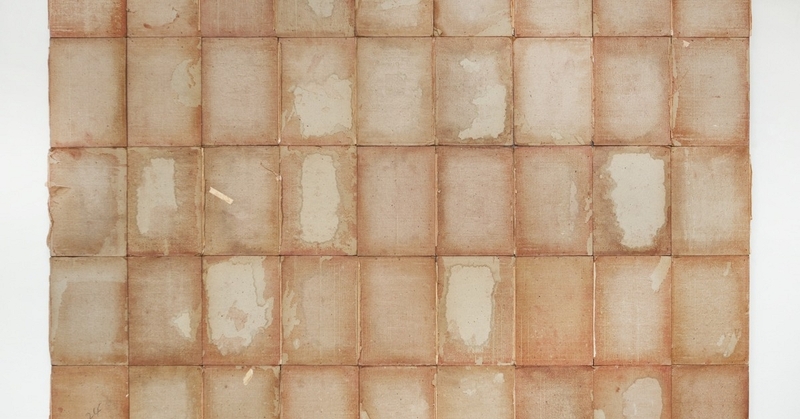 Consisting of just three large works, Jones’s wall-mounted abstractions take as their source material the covers of hundreds of law books which the artist has ripped apart and refashioned into geometric patchworks. Motivated by national conversations on police brutality and the failures of the justice system, Jones, whose previous body of work used encyclopedias as a source material, turned to legal texts. 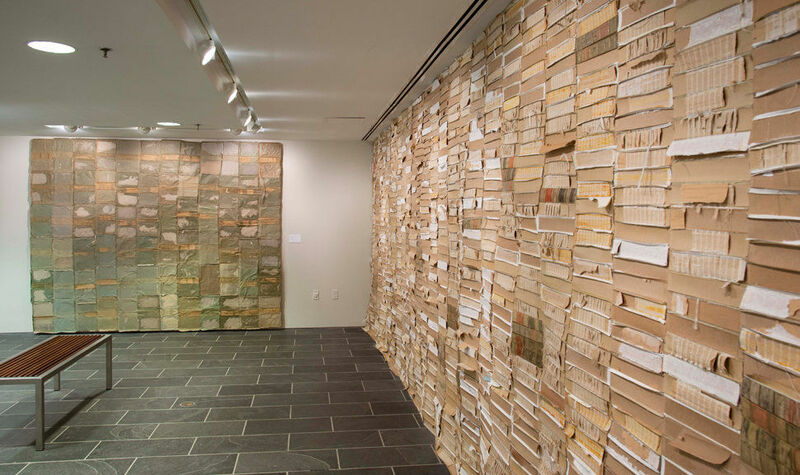 But the only traces of language visible in the exhibition are those on the spines of the exhibition’s titular work, “Unbound,” the wall-mounted piece that anchors the space. 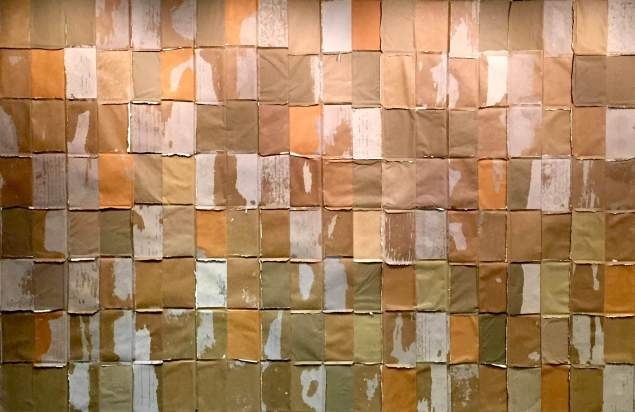 “Unbound” is flanked on either side by two smaller works on canvas that display the deconstructed cover material, which varies between cardboard, paper, and canvas. Taken as a whole, the show is subtle yet expressive. 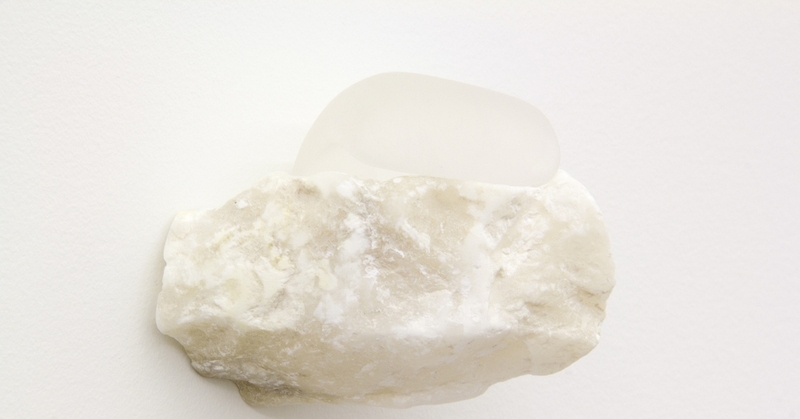 In a recent conversation, the artist spoke with ARTINFO about his process and work. Tell me a little about how you came to this site-specific project at the Studio Museum, and how it relates to the work you’ve done with books so far. In terms of having a show, Naima [J. Keith] saw my work at the gallery I work with, Michelle Papillion in LA, and we started having a conversation about potentially having a show and it came down to me submitting a proposal. This was before they contacted me about the Wein prize, which is a separate thing, because people who have gotten the prize haven’t necessarily had a show there. That’s how it came to be. In terms of working with the space and working with the material, the really large piece with the spines, titled “Unbound” — I wasn’t intending it to making it the size of the wall, but with it being a site-specific space it pushed me to make it much larger than I originally intended it to be. That piece is a continuation of a much smaller piece I made from spines. I made a piece from a set of spines from an encyclopedia, but it’s basically embedded in a wall, the spines themselves sewn together and embedded in a hole in the wall, and about half of it drapes off the wall. I had considered making a larger piece with spines based upon that piece, and I came to the law books because I was really thinking about a lot of things, what happened around the country in terms of law and law enforcement and I immediately told myself I wanted to get a set of law books and work with those and see what they looked like visually, I really wanted to obtain the books. The first set of books I purchased was maybe about 500 books or so, and sort of a discovery because I had no idea what they were going to look like inside, on the outside they are all completely the same, the finish is the same, but underneath the material is completely different, from canvas-like material to paper-like material, which was really interesting. That was a discovery in and of itself and kind of a risk, so to speak, because I started acquiring the material thinking that’s what I was going to use for the show, and it just worked itself out.